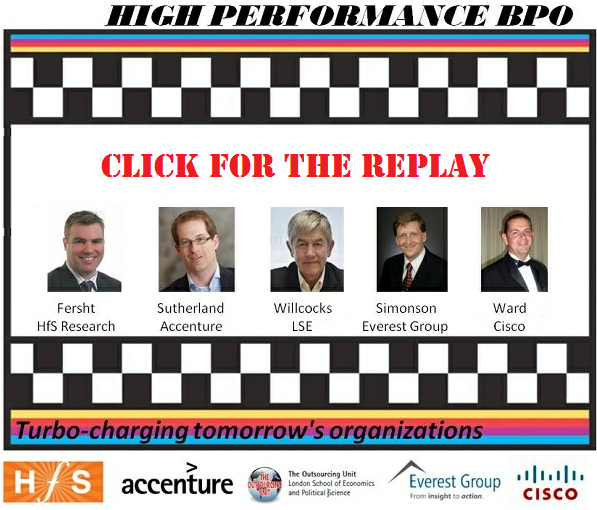 Missed today's revved-up BPO discussion? How could you? What else were you doing? In any case, we recorded the track for you! Click here for a rare chance to hear how some organizations have evolved their BPO relationships from being merely "operationally efficient" through to being genuinely "transformative" for their businesses across finance, HR, customer management and other industry-specific processes. Or... as we put it today, going from low performance to high performance. Yes... it's time to stop leaving the money on the table. Listened in to the webinar but want to revisit the slides? Click Here for a copy of the slides.